Tagged under Dolls, Festival, Japanese Terms, Holidays. 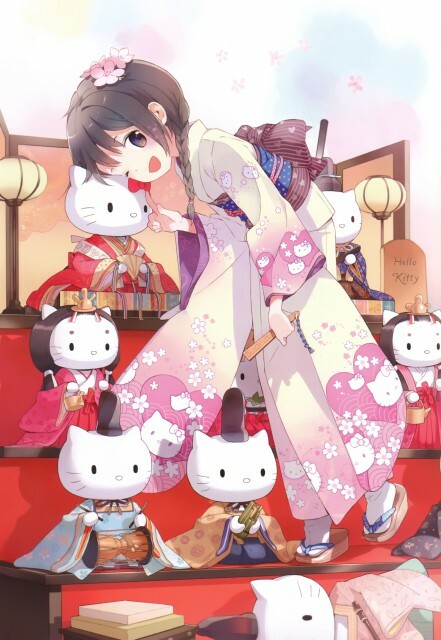 Hina-matsuri (雛祭り, "doll's day") is a Japanese holiday celebrated yearly on the 3rd of March. Starting in February and until the 4th of March, families build platforms covered in red carpet, displaying several dolls representing the Emperor, Empress, and members of the court, all dressed in clothes from the Heian period (794 - 1185 A.D.). It is believed that leaving the dolls out too long past the date of the Hinamatsuri will result in the family's daughters marrying late. The custom was picked up from folklore, following the belief that dolls could contain bad spirits within them; as such, straw hina dolls used to be sent down the river, to "carry" the troubles away. In modern times, the dolls are set adrift to sea and brought back to shore after some time, to be burnt at the local shrine.